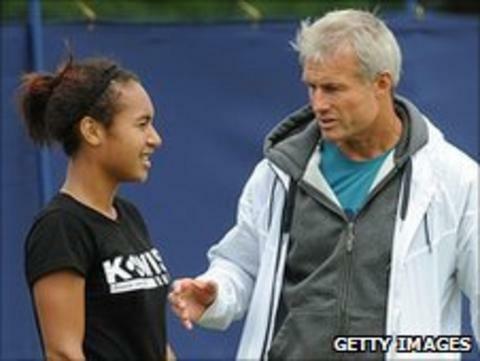 Nigel Sears has resigned as the Lawn Tennis Association's head coach of women's tennis to coach former world number one Ana Ivanovic. Sears, 54, who is the father of Andy Murray's girlfriend Kim, also captained the Great Britain Fed Cup team. During his four-and-a-half years in the LTA role, five British women broke into the world's top 100 and two made it into the top 50. "I feel we've made considerable progress over this period," Sears said. LTA chief executive Roger Draper added: "I would like to thank Nigel for his significant contribution to the LTA. "Nigel has been instrumental in developing the player programmes for our most talented girls and women, and he leaves behind a real sense of confidence and optimism that we can look forward to a bright long term future in the international game." Serb Ivanovic, the current world number 18, said she was "excited" about the new partnership. "I couldn't be happier," said 23-year-old Ivanovic, who was runner-up at Roland Garros in 2007 and at the 2008 Australian Open. "I've admired Nigel for some time now and I can't wait to start working with him on court. "It was important that I waited for the right coach, and we are both excited about the challenges ahead." Despite the overall improvement in results of British women tennis players, Sears told the Guardian last month that there was a risk of getting carried away. "I don't want to go overboard - we're still talking about second-round defeats," he said in June. "The girls are definitely getting better. They are making progress and the rankings reflect that. But it is little steps," said Sears. "If we are judging things on tour standards, we shouldn't be getting too excited about second-round defeats - even if the performances themselves were good ones." British number three Anne Keothavong told BBC Sport that Sears was a key contributor to the improvement of Britain's female players. "I'm really sad to see Nigel leave and he's been great for British women's tennis over the last five years," she said. "We've had five girls break into the top 100 with him as coach, two of us have managed to break into the top 50. "There has been a revival over the last few years and a lot of it is down to his leadership and I'll miss him very much. "I guess I'll still see him out there at tournaments and I wish him all the very best with Ana." Sears, who coached former top 10 player Daniela Hantuchova on two occasions, lost his overall performance director Belgian Steve Martens this year before it was announced that commercial and communications chief Bruce Philipps would be resigning from his post. Two years ago, the LTA suffered a similar exodus when Carl Maes left his role as head of women's tennis, following the removal of the head of men's tennis, Paul Hutchins and the departure of Gary Stewart, who was the head of coach support. Draper played down the significance of another major figure to leave the LTA. "We're really sad to lose Nigel because he's a great guy, a great coach and he's brought a lot," he said. "But people come and go and you move on. What we try to do is adjust and strengthen the team where possible." British number one Elena Baltacha praised Sears for the impact he made and thanked him for helping her career. The 27-year-old said: "I'm really sorry to hear that we're losing Nigel but I'm sure he'll help Ana a lot. There's no doubt British women's tennis has improved out of sight since Nigel first came on board. "We've all got better individually and as a group, across the age range. Personally, I've learned a lot from Nigel and I'll always be grateful to him for that."